I have been a huge fan of Mira Grant’s writing, since I listened to Feed, the first book in her zombie series, Newsflesh. Now, I jump at every chance I get to read her stuff (though I’ll admit that I still need to try her work under her main pen name of Seanan McGuire). When I heard that she was starting a new series, I jumped at the chance to listen to it. Into the Drowning Deep is the story of a group of scientist who go out on the search for mermaids. The story start with Imagine Network, a science-fiction TV station that has done some documentary style stories on things like Bigfoot, Yeti and more. Imagine sends a crew out in search for mermaids. The ship and all passengers are never seen again, but there is some footage that was uploaded before the ship went silent. Fast forward several years and Imagine wants to find out exactly what happened. They get a group of scientists together to go out and find these mermaids. They start with Tory, whose sister was on the original ship. This book has a great cast of well-developed, diverse characters, which is a standard for Grant. Her characters are completely unique in every way. Dr. Jillian Toth is the scientist who has always believed that mermaids exist. Theo Blackwell is the right-hand man of the CEO of Imagine Network. He’s also got a leg injury that’s left him disabled. Toth and Blackwell are in an estranged marriage. Hallie, Holly and Hannah are sisters and each in their own disciplines of science. Holly and Hannah are twins and both were born deaf. Hallie is their older sister and also the twins’ translator. Olivia is the “host” of this voyage for the Imagine Network. She is the on air personality that will tie all the scientists stories together along with her cameraman, Ray. Olivia is also mildly autistic and doesn’t deal with crowds. Ray is also her protector, when the need arises. I think two of my favorite characters are Jacques and Michi Abney. I don’t think I would like these two if I ever met them in real-life, but I do like them in this book. I know that sounds weird, but I’ve never claimed to not be weird. Anyway, they are big game hunters (anyone who knows me, knows that I’m completely against trophy hunting, so you are probably really confused as to why I like them). There was just something about these two and their deep love for each other that made me love them. I didn’t like them at the beginning, but the more I got to know them and see them together, I just fell in love (I still don’t like big game hunters though, that will never change). There aren’t any “bad” characters in this book. I don’t think there is any Grant book that I’ve read. There are “bad guys”, but they are written so well, that you can’t help but fall in love with each and every character (even if you love to hate them). The problem then arises that never in any of Grant’s books that all the characters will make it out alive. These are a sci-fi/horror books after all. I don’t believe you can have a horror story where everyone makes it out alive. That just wouldn’t work. I really love how Grant writes these stories with excerpts from interviews, news articles and other clips (again, a common theme in her books). You also get POVs from many different characters (though Tory is really the “main character” in this story). I love that you also get POVs from the dolphins (the dolphins were really amazing. I loved them) and even the mermaids, at times. It really helps to get every side of this story. I really hope that we are getting more books in this series. I really want to learn more about this world and about these mermaids. If you’ve never tried Mira Grant, I highly recommend her stories. 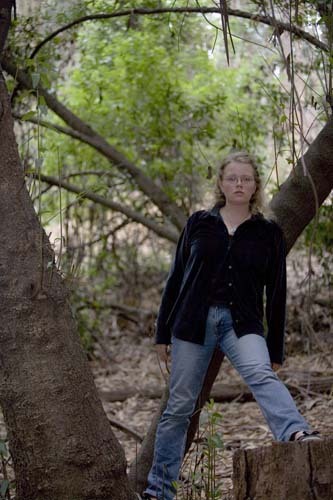 In her guise as mild-mannered urban fantasy author Seanan McGuire, Mira was the recipient of the 2010 John W. Campbell Award for Best New Writer. You can find her works as both Mira and Seanan at her main bibliography page. Seanan’s website is the best place to find information on where both she and Mira will be appearing. You probably know me best as “Al” the tomboy from “Step By Step”… (yep, that was me in that backwards hat) or maybe from movies that re-run all the time like “Valentines Day” or “You Again” or “Georgia Rule” (I play the Mormon girl Lindsay Lohan nearly runs over with a truck- good times). I’m Melissa Joan Hart’s slutty friend Jackie on “Melissa & Joey” (typecast again!) or maybe you’re up early and see me guest Co-Host on VH1’s “Big Morning Buzz” with Nick Lachey. If you like reality TV, I host “Party Down South” reunions on CMT and sometimes you can hear me as Joyce Kinney on “Family Guy” or Sumo’s Mom on “Clarence” (Catroon Network) or some random people on “Trip Tank” (Comedy Central). If you’re a gamer, you play me as Jane in The Walking Dead game. If you commute a lot, listen to me in various audiobooks like “The Coldest Girl in Coldtown”. In my spare time, I like to dance and sometimes I get hired to choreograph for shows like “The Goldbergs” and “True Blood”. Theater is always my first love, which is why I created and produce a rad live show called “Worst Ever” (look for our TV version soon!) Whatever the case, I’m glad we found each other. Whew. Thanks for the support! Great review Melanie. Grant is an author that I’ve heard a lot about and even though horror is not a favorite genre I do like a scare here and there. The characters in this series are so great. It is a suspense with monsters and many people will not live through the story. I hope you’re willing to give it a try. YES! This made my top ten read for 2017, so thrilled you loved it, I am sure this rocked on audio. It was such a fun book. I can’t wait to see what else she has in store for this series. I hope that you give this a try. It is a really great story. I fell in love very quickly with this story. I love horror on audio, if it has the right narrator. Christine Lankin does a great job. I love her work. Her characters are amazing. But I get it. Not everyone likes, or can do, horror. This is on my TBR. I normally don’t read horror but the mermaids peeked my interest. It sounds interesting how she mixed in interviews, news articles and different POVs. Great review! It is a really great story. I love how she mixes in the interviews, articles, etc into her stories. She’s done that with previous series too. I love her writing. The characters are amazing. Thanks so much Kristin. I really loved this book. I still need to try Seanan’s stories. I am not sure if this would be a book for me, but I do like how you say there are no bad guys. It does sound very unique how these books are written with new clippings and multiple points of views and such. Great review! I know a lot of people aren’t into horror. Thanks. I hope you get to try it soon. I loved this book so much. Ah! I did not know they were the same author. I have a few of the McGuire ones on my list. Glad you enjoyed this one! I plan to try McGuire some day. I love her work as Grant. I think I’ve read everything under this pen name. Not a huge fan of the writing style of interviews and things like that but I do want to read this one! The articles and things aren’t the entire story. Just intros to chapters. The rest is normal third person narration. I read a story that was told entirely by journal entries, articles, etc. I was not a fan. I felt like this added to the story.